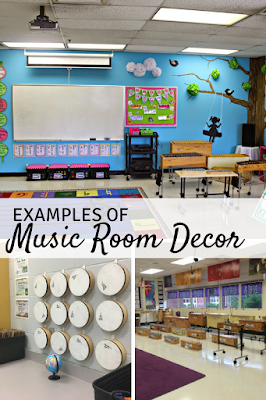 Thinking about how you'd like to decorate your music room this upcoming school year? In this post, I'm showcasing 10 great examples of music classroom decor, to inspire you with your classroom! Here goes! I love Tracy King's letters...and the decorations on the piano! Click here to read more about Tracy's farmhouse-themed classroom. 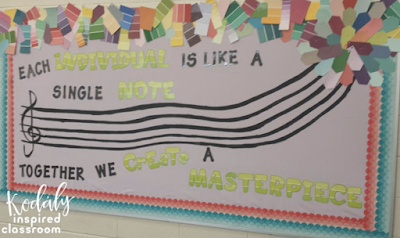 Amy Abbott at Music a la Abbott was so creative with this bulletin board! I love how the genie is rising out of the bulletin board, and how she uses an oddly-shaped space to create a board! 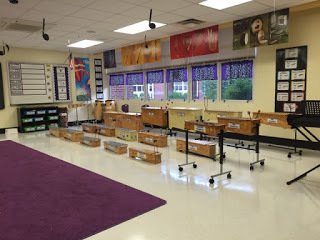 This next picture is from my classroom...I love storing my hand drums like this! 3M hooks are the best! Jena Hudson at Sew Much Music wrote about her classroom decor in this blog post...LOVE the use of records with the silhouette. 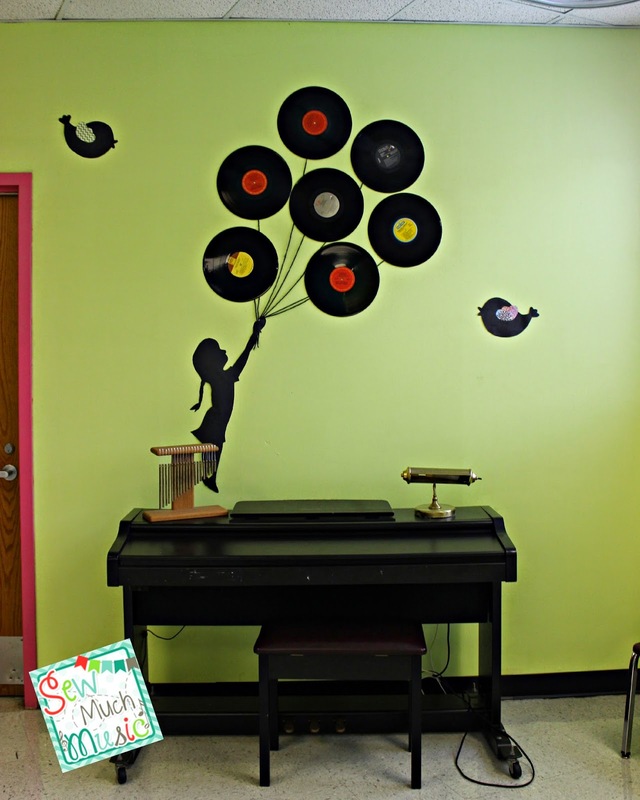 Aimee from O For tuna Orff had a similar look in her classroom, with silhouettes. I also love how she stores her Boomwhackers! 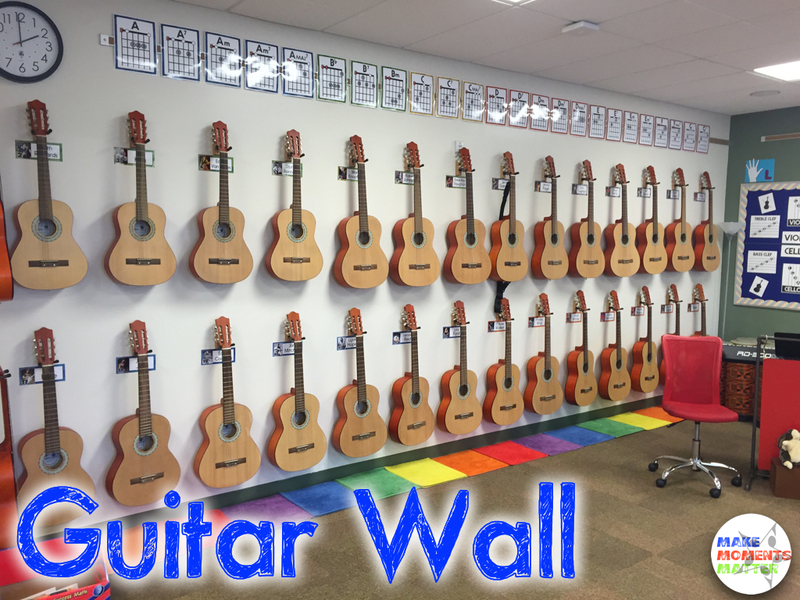 Lindsay from Lindsay's Kodaly Inspired Classroom wrote about her watercolor themed classroom in this post. 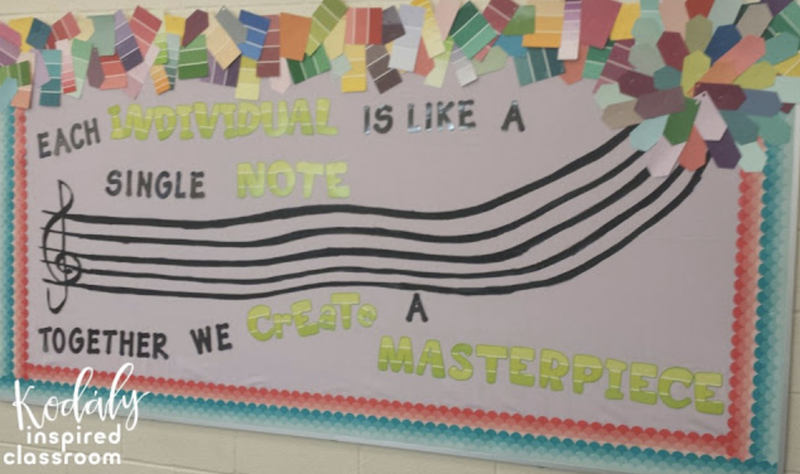 I love how she incorporated paint chips into the bulletin board! 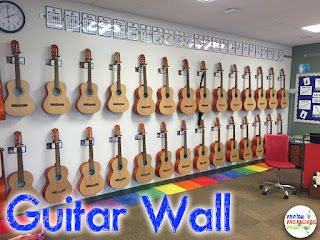 David Row at Make Moments Matter wrote in this blog post about his guitar wall...what an efficient and fun way to store them! 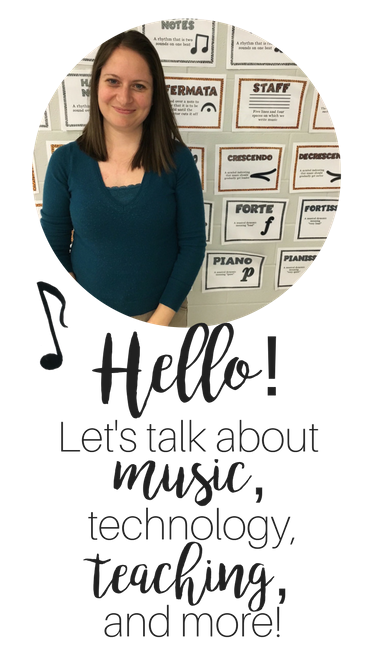 Angie from I Heart Teaching Music has a composer corner...such a fun idea! I also love the way she displays the movement cards by Cori Bloom. 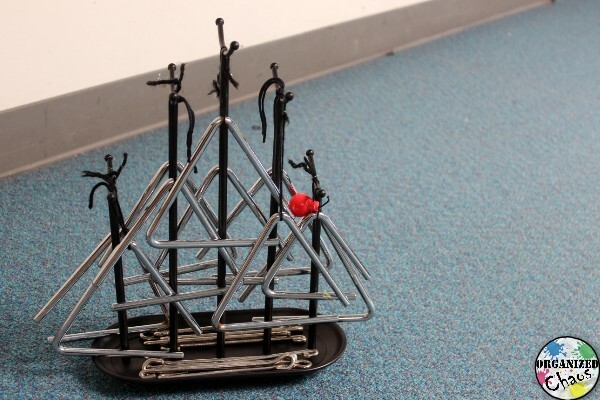 Music with Mrs. Dennis has music notes hanging from her ceiling...so cute! Elizabeth from Organized Chaos wrote about using a jewelry organizer for triangle storage in this post...how fun is this? It looks like a sailboat to me! And so much easier to find the beaters! 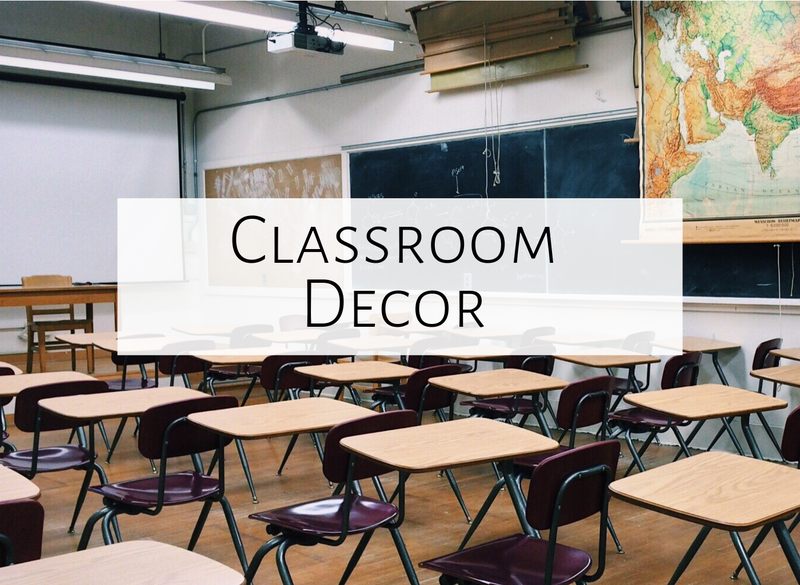 I hope this inspires you as you think about designing your classroom! Happy planning and designing!